Trollkatta: DT The Paper Nest Dolls Norway - Challenge #1 Anything Goes, Candy Winner and 1st Birthday Bloghop!!! 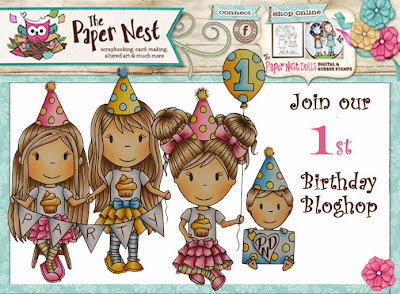 DT The Paper Nest Dolls Norway - Challenge #1 Anything Goes, Candy Winner and 1st Birthday Bloghop!!! to use a Paper Nest Doll Stamp. men ser aller helst at du bruker et Paper Nest Doll Stamp. Chick Avery colored with Distress Ink Refillers and watercolor pencils. Stempel: The Paper Nest Dolls - Chic Avery - fargelagt med Distress Ink Refill og akvarell blyanter. Sommerfugl stempel: North Star Stamps - er varme embossed i sølv. Distress Ink - Vintage Photo. Charms; Korthobby. Liquid Pearls fra Tim Holzt. Rhinestones og silkeband. And now to the prizes! / Og nå til premiene! Og vi er så heldige!! - Vi har fått KS - Kreativ Scrapping - som vår hovedsponsor i 2014. Og det er best du setter deg ned før du får høre hva slags premier vi har fått...........De har en fantastisk utfordringsblogg også med masse av inspirasjon - Du finner Januar utfordringen til Kreativ Scrapping her, og det er masse av inspirasjon å hente fra det fantastiske DT de har. Og mens du er der og titter, så burde du passe på å stoppe opp i den flottenettbutikken de har. De har enerett på å selge PND Gummistempel i Norge. Isn`t it amazing??? A big Shot machine* We are so lucky to have them on board. Er det ikke fantastisk??? En Big Shot Machine* Vi er så heldige som har fått de med oss på laget. Karin, I love your card, you have coloured her beautifully! Beautiful card with great papers. Thank you for playing with us SFC. Your card is gorgeous. Thanks for sharing at The Cheerful Stamp Pad. I have been looking at your site. Would you be interested in being on my DT? The only question I have is can you describe your cards in English for the DT posts without a lot of problems? Get back with me with your email etc. if you are interested. Wow,for et fantastisk kort!Så stilig med denne bretten og lekre fargerike ark!Nydelig fargelegging!! I absolutely adore this card. The coloring is incredible. And the card layout is interesting. Thanks for sharing your creation with us at Make it Monday. Lovely so much deatails and great image. I like the spring feeling it made. This is really pretty. I love the paper combo and how you used those pearls. Thanks for sharing at Craft Your Passion. Hope to see you again. Beautiful Work! Thanks for sharing at Love To Scrap. Hi Karin, welcome to the Dolls! Loooove your beautiful colouring and design is gorgeous! Your coloring is awesome and I love your choice of papers - so creative! Thank you for joining our challenge at Pile It On and I hope you will come back again. Kortet ditt er fantastisk nydelig!! Herlige detaljer, og flott fargelagt! Thanks so much for playing along with us this week for the Paper Nest Dolls "Anything Goes Challenge” with us! Just loved your card, and hope to see you back here next week!